One out of every 100 or so babies is born with some kind of obvious defect or deformity. There are many different types. In this chapter we describe a few of the most common: cleft lip and cleft palate, extra or joined fingers or toes, and short, missing, or deformed limbs. We also discuss children born with multiple contractures (arthrogryposis). Please also refer to the chapters on club feet (Chapter 11), and spina bifida (Chapter 22). Poor nutrition during early pregnancy. This is thought to be one cause of cleft lip and palate. Genetic (hereditary). Sometimes certain defects run in families. For example, if one parent was born with an extra thumb, there is a greater chance that a child will be born with a similar defect. One or both parents may be 'carriers' of the factor that causes a defect, without having it themselves. However, it may be present in relatives. Often both parents must have a 'defect factor' for a child to be born with the defect. For this reason, birth defects are more common in children whose parents are closely related, and who therefore carry the same defect factors. Medicines, pesticides, chemicals, and poisons. Especially during the first 3 months of development, a baby in the womb can easily be harmed by chemicals and poisons. Many medicines, drugs, and pesticides (plant, insect, and rat poisons) can cause birth defects if a pregnant mother is exposed to them. German measles. If the mother gets German measles during the first 3 months of pregnancy, it can cause defects in the baby. These usually affect the senses (hearing and seeing), the brain (cerebral palsy and retardation), or organs inside the body (heart, liver). Sometimes the baby is born with 'rubber band-like' grooves on the limbs and deformed or missing fingers or limbs. Children born to mothers 40 years of age or older are more likely to have Down syndrome and defects of the hands, feet, or organs inside the body (heart, liver). In this age group, about 1 mother in 50 will have a child born with Down syndrome or defects. For ways to prevent birth defects, see Page 124. A cleft lip (or 'hare lip') is an opening or gap in the upper lip, often connecting to the nostril. A 'cleft palate' is an opening in the roof of the mouth connecting with the canal of the nose. Usually 1 in about 800 children is born with a cleft lip, cleft palate, or both. Babies with these conditions often have trouble sucking, and may choke or gag on food that gets into their nose. Usually breast feeding is the best way to feed these children. Make every effort to have the defects corrected by surgery since this can greatly improve the child's looks, eating ability, and speech. The best age for surgery is usually at 4 to 6 months for the lip and about 18 months for the palate. To prepare for surgery, parents should frequently stretch the deformed lip, so that the 2 sides meet in the middle. Even after the cleft lip and palate have been successfully repaired, speech problems often occur. The family should gently encourage the child to speak as clearly as she can. Lip and tongue exercises may help (see Page 314). The child who cannot get surgery may need to learn sign language, using her hands to help people understand her (see Page 266). Some children are born with 2 or more fingers joined together. This does not cause much difficulty in use of the hand. However, special surgery can often separate the joined fingers. When a child is born with a small extra finger or toe that has no bone in it, you can tie a string tightly around it, like this. In a few days the finger will dry out and fall off. Larger extra fingers or toes, if they get in the way, can be removed by a surgeon. A child who is born with a toe that sticks out may need surgery in order to wear shoes. The toe can sometimes be put straight. At other times it may be simpler to remove it. To get the best results, the surgery should be done by a specially trained orthopedic or plastic surgeon. Sometimes medicines a mother takes early in pregnancy cause a child to be born with missing or incomplete arms or legs, or both. A child born without arms but with normal legs and feet can often learn to use his feet almost as if they were hands: for eating, writing, drawing, playing games, and doing many kinds of work. It is important to encourage the child to use her feet, or whatever part of her body possible, to do everything she can for herself. The child who is born with incomplete arms and legs can be helped a lot by artificial arms with hooks for grasping (see Page 230). We do not give instructions for making these arms in this book, as they are fairly complicated. However, try every possibility to get artificial arms for the child. They can make a very big difference in her life. If possible, the child should get her first limbs by age 3. For ideas about aids and artificial limbs for children born with missing or defective hands and feet, see Chapter 27, "Amputations," and Chapter 67, "Artificial Legs." This little girl was born with 'rubber band-like' constrictions in her hand and leg, and with parts of her fingers and foot missing. The deformities happened because her mother had German measles when pregnant. Her foot looked like this. Village rehabilitation workers made her a plastic brace with a partial foot built into it, so she could wear a regular shoe or sandal. A firm foam-plastic foot was shaped and attached to a plaster mold of the foot (see Chapter 58). The plastic brace was heat molded over this. Arthrogryposis means 'curved joints'. 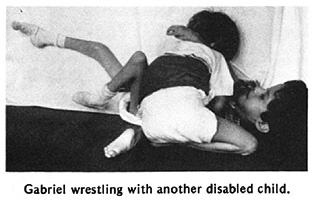 Children with this disability are born with stiff joints and weak muscles. The strange position of arms and/or legs may give a child the look of a wooden puppet. In some children, both arms and legs may be severely affected. In others, only the legs or feet, or hands or arms may be affected. A child born with clubbed feet and with one or both arms stiff with hands turned out, may have arthrogryposis. The cause of arthrogryposis is not known. It may be avirus infection of the mother, during pregnancy. Arthrogryposis is a rare condition in most of the world, but for unknown reasons, in parts of Central and South America it occurs more frequently. Rehabilitation of the child with arthrogryposis aims at helping the child do as much for herself as possible. Some children with arthrogryposis are able to walk, especially if contractures are corrected. Correction of club feet (see Page 115) and hip and knee contractures should begin gradually, and without forcing, soon after birth, with casting (see Page 565), positioning, and/or range-of-motion exercises (see Page 115). Often, however, contractures of arthrogryposis can only be corrected by surgery. The possible benefits-and losses-which surgery may bring should be carefully evaluated. For example, a stiff elbow in a bent (contracted) position may be much better for eating than an elbow that has been straightened, and will not bend. Most children with arthrogryposis are very intelligent. If given a chance, many can learn to do a lot of things for themselves, even with severe disability. Often they try hard and are eager to learn.It is very important that these children be encouraged and helped to do as much as they can for themselves, and that they go to school. The following story may help give you an idea of the possibilities of a child with arthrogryposis. Gabriel is 7 years old. He lives with his family in Mazatlán, Mexico. He was born with arthrogryposis. Some of his joints are stiff and straight, others are stiff and bent. He lacks most of the muscles in his arms, legs, and hands. He cannot sit alone or lift a hand to his mouth. Gabriel's parents love him dearly and care for him tenderly. However, when he was born, doctors told them that nothing could be done for him. So his parents grew used to doing everything for him. As he grew older, they carried him in their arms, changed his diapers when he dirtied them, and gave him food in his mouth. They treated him like a baby-though he no longer was one. When his mother learned of PROJIMO, she took Gabriel there, hoping that with surgery or special medicine, he might improve. The village rehabilitation workers at PROJIMO investigated all possibilities. They even took him to a famous hospital for disabled children. But the specialists said they could do nothing for Gabriel. Fortunately, therapists who were visiting PROJIMO as instructors explained to the team that in fact there was a lot that could be done, not to help Gabriel walk, but to help him do more for himself-within his possibilities. The team began to work with the family, to help Gabriel become more independent. Now, with the help of the village rehabilitation workers and his family, Gabriel is able to meet some of his basic needs for himself. He feels less like a baby and more like a you ng man . He has stopped using diapers; he asks when he needs to go to the toilet. He has learned to use his mouth like a hand, to hold and do things. He has learned to feed himself. He swings his arm onto the table using his neck muscles, and hooks his hand over a spoon. Using the edge of the table and the rim of the dish to push against, he see-saws the spoon to his mouth. To drink he uses a straw with a bend in it. Gabriel's family has joined Los Pargos, an organized group of families of disabled children. He attends school in a specially adapted wheelchair that he can move himself. He is learning to read, write, paint pictures, and to play with other children. There is much more that Gabriel and his family will be able to achieve, now that they all see how much he can do for himself. Gabriel is happy and eager to learn more. Eating aids are described on Page 330 to 332. Writing aids are shown on Page 5, Page 230, and Page 501. Wheelchair aids are shown in Chapter 64. It is not possible to prevent ail birth defects. There are, however, ways to make it less likely that children will be born with birth defects. Avoid marrying close relatives. If you already have one or more children with a birth defect, consider not having more. Avoid all medicines during pregnancy unless you are sure they will not damage the baby. (Aspirin, vitamins, some antacids, and iron in the correct dose are all right.) Avoid any contact with pesticides and other poisons. Tobacco and alcohol during pregnancy can also damage the developing child. While pregnant, stay far away from children with German measles if you have never had it. If you are not pregnant, try to catch it before you get pregnant. Vaccine exists for German measles, but is not often available. Consider not having more children after age 35 or 40, or if you have had one child with Down syndrome, since the chance of having another is increased.